The government has yet again failed to implement the vast majority of the budget promises, even with an ‘Implementation Unit’ which was supposed to have been established under the Finance and Mass Media Ministry to specifically track the progress of the budget proposals and report on them. With only 8 percent of the promises made in the 2018 budget being fulfilled, or making some progress, within the first half of the year, an analysis of the budget proposals and their status suggests that the Implementation Unit has not fulfilled its duties. The unit that was set up by Finance and Mass Media Minister Mangala Samaraweera, as proposed in the 2018 budget (proposal 297), was said to be headed by Senior Advisor to the Finance and Mass Media Ministry, Mano Tittawella and Economic Advisor (to the Ministry) Deshal de Mel. The unit was responsible to monitor the implementation of the proposals and make available to the general public a progress report on a monthly basis. While no such report has been released since the establishment of the unit, economic think-tank Verité Research shared with reporters yesterday that in their efforts to update an online budget tracker platform, budgtepromises.org, the Finance Ministry’s National Budget Department had told them that no such unit exist. According to the National Budget Department, those requiring information regarding the progress of the budget proposals must file a Right to Information (RIT) application to relevant ministries as no compilation is being done at the Finance Ministry. Although National Budget Circular No. 03/2017 affirmed the establishment of such a unit, under the Department of National Budget to “monitor the implementation of all capital projects including budget proposals,” the Finance Ministry had responded to an RTI requesting for the same stating “no unit is established in the Department of National Budget under the budget proposal 297”. Meanwhile, Verité Research said the progress reports forwarded by individual ministries, in the absence of the Implementation Unit, were lacking consistency in tracking and reporting of any progress made on relevant budget proposals. The think tank also pointed out that despite filing RTIs, not all the ministries were keen on sharing any progress reports. The least cooperative ministries according to Verité were: Ministry of Agriculture, Ministry of Education, and Ministry of Highways and Road Development. Whereas the most cooperative ministries were: Ministry of Irrigation and Water Resource Management, Ministry of Fisheries and Aquatic Resources and Ministry of Housing and Construction. 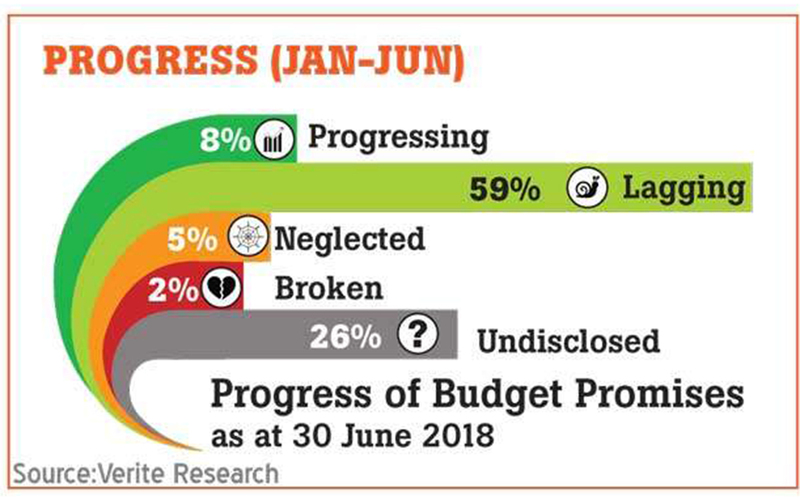 With regard to the fulfillment of the 2018 budget promises for the period from January to June, 59 percent of the proposals are lagging, 5 percent neglected, and 2 percent broken. The status of the remaining 26 percent of promises remains undisclosed by relevant government authorities.